Strap Leaf Caladiums have elongated and heart shaped leaves. Height 12" to 14". Uses: hanging baskets, borders, plantings in front of fancy type. All varieties of strap leaf caladiums grow well in filtered shade or afternoon shade with morning sun. Varieties of caladiums that are tolerant of all day sun are marked with (sun icon). 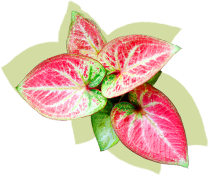 Click on the thumbnail to see larger image and to order the strap leaf caladium variety of your choice. We are sold out for the year. Thank You! Please Note: Caladium bulbs are available on a first come-first served basis. Your caladium order will be reserved when we receive it. Some varieties sell out before the season is over. We offer free shipping via UPS within the Continental United States. You may request a ship date of April through June 1, weather permitting. We do not ship when temperatures are below 40F. For sales information or questions, please email sales@caladiumsonline.com.